LAKE VIEW TERRACE, California (CNN) -- A massive fire that has charred more than 147,000 acres in Southern California and destroyed dozens of homes north of Los Angeles was caused by arson, a U.S. Forest Service spokeswoman said Thursday. 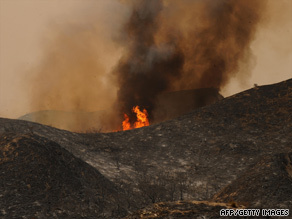 A wildfire burns close to blackened hills in the Angeles National Forest outside Los Angeles on Wednesday. A homicide investigation has been initiated by the Los Angeles County Sheriff's Department into the deaths of two firefighters as a result of the Station fire, said spokeswoman Rita Wears. The firefighters died Sunday in a vehicle crash while trying to escape fast-moving flames. Families in 11 homes were awakened at about 4 a.m. and given three hours to leave their homes near the Dillon Divide community. "We're fighting for every foot of containment we can get on this fire," said U.S. Forest Service Fire Chief Mike Dietrich. He said firefighters have made progress controlling the northern and western parameters of the fire, but the priority is to keep the southeastern corner of the fire away from areas along Interstate 210, including Pasadena, Arcadia and Sierra Madre. The blaze is headed toward the San Gabriel Wilderness Area of the Angeles forest. The San Gabriel represents the eastern edge of the fire, he said. Nearly all the fire was in forest land and the nearby foothill communities, including La Canada Flintridge, La Crescenta and Acton. "This is a very complicated situation, and it continues to be complicated as it moves east," Dietrich said. The fire has destroyed 64 homes, three commercial properties and 49 outdoor structures since it began last week, authorities said. The state has spent about $27 million so far fighting the fire in the Angeles National Forest, Dietrich said. Firefighters expect to have the blaze fully contained by September 15. Earlier, Gov. Arnold Schwarzenegger was asked about the cost of the firefighting, given the state's precarious financial position. "I've made it clear that even though we have a budget crunch and we have an economic crisis and we just solved a $23 billion deficit, we will always have the money available to fight the fires because public safety is our No. 1 priority," Schwarzenegger responded. That budget gap covers two years. The governor said he insisted that the state budget he signed in July have a $500 million reserve for emergencies such as fires. California has had 5,000 blazes so far this year, he said. He said 21 firefighters have been injured battling the Station fire, in addition to the two killed Sunday. While temperatures remain high, the humidity level increased on Wednesday and Thursday -- a boon to the firefighting efforts. Firefighters could get another break if temperatures cool off on Friday, as expected. CNN's Barbara Starr in Lake View Terrace, California, contributed to this report.